Making Moments is a daughter of 2yo Breeders Cup winner WAR PASS from the mare Moments I Treasure . Unbeaten at 2, War Pass captured the Bessemer Trust Breeders’ Cup Juvenile (gr. I) and the Champagne Stakes (gr. I). He was named champion 2-year-old male in 2007. At 3, he ran second in the Wood Memorial Stakes (gr. I). 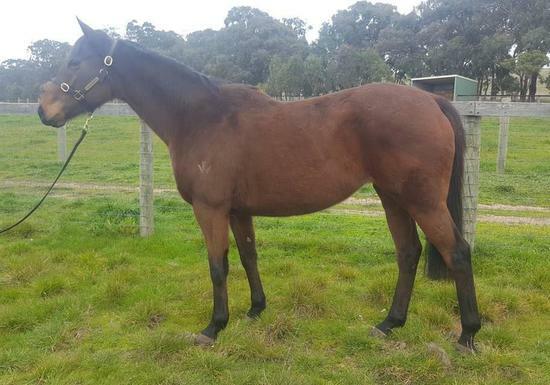 The dam of this mare Moments I Treasure is a very interesting mare indeed ,Firstly she is a ½ sister to multiple Gr1 winner in the US , ALPHA , 6 wins , $1,815.543. He stands at stud for Darley in the USA. Making Moments wasn’t served last season and is ready for an early cover. WAR PASS (USA) (2005). 5 wins-4 at 2, Breeders' Cup Juvenile S., Gr.1. Sire of 177 rnrs, 132 wnrs, inc. SW Java's War (Keeneland Blue Grass S., Gr.1), Revolutionary, Galaxy Pegasus, Sandbar, Confrontation, Giftorm, Never Can Tell, Ore Pass, Tulira Castle, SP Bondeiger, Flashing Speed, Laddie Boy, Lunarwarfare, Trichologist, Go Max, Sweet as a Rose, Cruzette, Dangerous Pass, Peace No War, Scooter Bird and of War Jet, Mandalong Kiss, War Ksar, etc. Bourgeoisie (g. by Stratum). Winner at 1400m, MRC Polytrack P.
Mozart Eclipse. Winner at 1400m in 2017, Singapore TC Class 5 H., 3d Singapore TC Class 5 H.
Treasure Son (g. by Haradasun). Winner at 1200m in Aust. ALPHA (Bernardini). 6 wins-1 at 2-from 7f to 1¼m, US$1,785,667, 110,100Dhs, Saratoga Travers S., Gr.1, Woodward S., Gr.1, Jim Dandy S., Gr.2, Aqueduct Withers S., Gr.3, Count Fleet S., L, 2d Aqueduct Wood Memorial S., Gr.1, Belmont Champagne S., Gr.1, 3d Saratoga Alydar S., L, 4th Hawthorne Gold Cup, Gr.2, Belmont Suburban H., Gr.2. MYSTIC MELODY (Seattle Slew). 2 wins-1 at 2-at 1400m, 1600m, Saint-Cloud Prix Coronation, L, Deauville Prix Tanit, 2d Longchamp Prix Vanteaux, Gr.3, Saint-Cloud Prix Saraca, L, 3d Deauville Prix des Reservoirs, Gr.3. Producer. Lavender Sky (Mt. Livermore). 2 wins-1 at 2-at 8½f, 1¼m, 2d Santa Anita San Gorgonio H., Gr.2, Hollywood Park Audrey Skirball-Kenis S., L, 3d Hollywood Park Dahlia H., Gr.2, Santa Anita Santa Ana H., Gr.2, 4th Hollywood Park Gamely S., Gr.1. Producer. Numaany (A.P. Indy). 9 wins-1 at 2-from 9f to 1¾m, Saratoga Allowance, 3d Nad al Sheba Al Bastakiya S., L, 4th Portland Mile H., L. Sire. Mister Angry. 13 wins-4 at 2-from 1400m to 3200m in GB and Saudi Arabia, Ascot Shergar Cup Classic H., 3d Newmarket Adnams May Day H.
Samarinda. 9 wins from 7f to 1¼m, Kempton Betdaq.co.uk Sports Betting H., Lingfield Park.co.uk H., Paul Kelleway Memorial S., 2d Kempton London Mile Qualifier, 3d Ascot Brunswick H., Kempton Totesport.com London Mile Final, Lingfield William Hill January Sale H.
Taxonomist. Winner at 1800m, 3d Deauville Prix de Bacqueville. Classical World (El Prado). 9 wins-1 at 2-from 1400m to 2400m in GB, Denmark and Sweden, 2d Jydsk Champion Sprint, 3d Dresden Sachsen Preis, L, 4th Klampenborg Pokallob, L, Dansk Jockey Club Cup, L-twice, Ovrevoll Walter Nilsens Minneløp, L.
FAUGUERNON (Martaline). 3 wins at 2100m, 2400m in 2017, Nantes Derby de l'Ouest, L.
MALL QUEEN (Sheikh Albadou). Winner at 2, Deauville Prix Yacowlef, L, 3d Chantilly Prix d'Arenberg, Gr.3. Producer. MUNNAYA (Nijinsky). Winner. See above. Balla Jidaal. 4 wins-1 at 2-at 1000m, 1200m in GB and U.A.E, Doncaster Breitling Swiss Chronoghraph 2YO S. Sire.